Day 4 of the PokerStars.net NAPT Los Angeles was a quick one as the field was trimmed from 19 to the requisite eight in just over four hours. Chris DeMaci came into the day with the chip lead and is still comfortably in that spot after adding another ~2.5 million chips to his stack over the course of the short day. He'll be the man everyone's chasing at the final table with 6,283,000 in front of him. Beginning the day in second place, Micah Raskin went from the penthouse to out-of-the-house as the first player eliminated, losing his full stack literally before his chips were even out of the bag. Raskin check-raised the flop, then called a three-bet as he and DeMaci put in 725,000 chips apiece. When the turned, Raskin announced an all-in, pointing at the pile of chips he'd only begun to assemble. It took several long minutes to empty his chip bag and get the hard count, and DeMaci eventually called the 1.366 million to see what was what. Raskin's were crushed by the chip leader's , and the knockout valued DeMaci up close to the 6 million chip mark within the first orbit. The field combined down to two tables at 16 players left, and that number ticked down to 13 within just a few hands. Matt Affleck was the short stack by this time and got his money in bad with his dominated by DeMaci's to seal his demise and conclude another deep run in a major tournament. Team PokerStars Online pro George Lind III was next to fall in 12th place, running a baby ace into a better ace with no help from the board. Jimmie Guinther lost a coin flip to Jason Mercier to depart in 10th place and his elimination cued the final redraw of the tournament. Nine seats held the final nine players, but there are only eight hole-card cameras on Wednesday's television table and one player had to go. 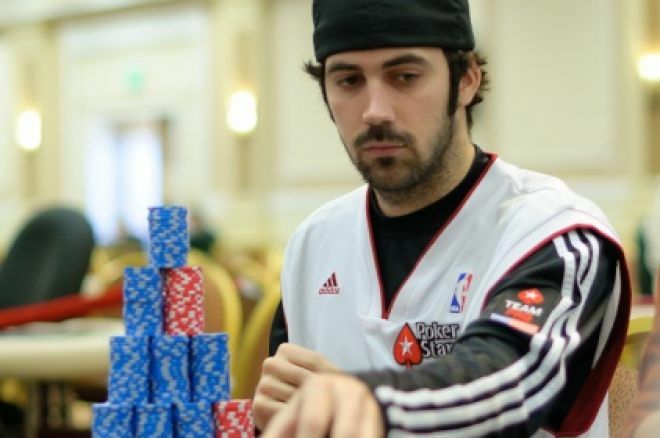 By this time, Alan Myerson had been riding the short stack for quite a while, occasionally shipping it in to pick up the blinds and antes and keep himself afloat. It worked every time but the last time, though, and Myerson's cutoff shove with ran smack into Ray Henson's . There was hope: the flop brought a big sweat, and the turn gave Myerson the straight and the unlikely lead with one card to come. He needed to dodge the hearts left in the deck to stay alive but couldn't. The spiked the river, sending him to the cashier and punching the eight survivors' tickets to the final table. If Mercier can manage to pull this thing out, he'll become the first player to win a Main Event trophy in multiple PokerStars tours. Oddly enough, the 2008 EPT San Remo that he conquered had the same number of players as this NAPT event: 701. Fate? Coincidence? We'll know the answer tomorrow night. Wednesday's final table is scheduled for 2:00 p.m. local time, and there's a venue change in store for the finalists. The television set is all wired and mic'd, and we're headed over to the Crystal Casino in scenic Compton to close the books on this event. Join our Live Reporting Team on Wednesday as we crown our final NAPT champion of Season 1! Final table star & FTOPS champion Jake "psutennis11" Toole is also a lead MTT instructor over at PokerNews Strategy. Find out the winning strategy that got him here and much more in this exclusive sample video.